Kuriyama - W Heavy Duty PVC Multi-Purpose Suction Hose - 6 in. X 100 ft. - OD: 7 in. 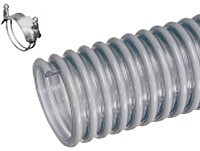 • Full vacuum suction/transfer hose at 68°F. (up to 4"). • Heavy duty gold dredging. • Clear PVC construction with grey helix - allows visual confirmation that material is flowing. Sizes 4" and above are formulated with HMW PVC compound for greater flexibility in sub-zero temperatures. • Convoluted cover design - provides increased flexibility.